To the average beer lover, Marble Brewery events seem to just happen. When this brewery hosts a street party, the splendor of community and delicious beer is front and center. The place gets packed with locals ready to have a good time. As live bands jam out on the patio, hundreds of beer lovers gather to connect and imbibe. Barbie Gonzales and Geraldine Lucero can assure you a lot goes into making the events seem effortless. Gonzales and Lucero are key players on Marble’s team and they absolutely love it. These two women have their eyes on the future successes of the brewery and they are cultivating a team that is grounded in community-based values. For Gonzales, it all started six years ago when she was looking in a new direction for her career. She was contemplating returning to school when she got a position at Marble Brewery as a bartender. After a few weeks of working there, she was hooked. “I realized that this culture, craft beer, Marble, there’s so much potential behind it and I really wanted the opportunity to grow and learn within this company,” Gonzales said in a one-on-one interview. 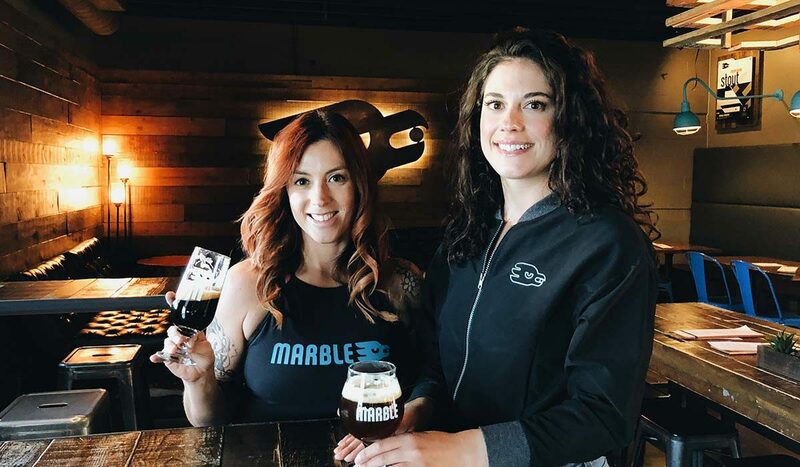 Gonzales vocalized her ambitions to Marble’s leadership and saw that Marble could really take the brewery scene in New Mexico to a whole new level. Now, she is the director of taproom operations and is responsible for everything that doesn’t involve brewing or distributing the beer. Lucero, Marble’s onsite event coordinator, got started at the brewery as a bartender as well. She and Gonzales quickly bonded and built a comradery based on creative ambition. “She knew that I wanted to do more with the craft beer industry and that I wanted to get out from behind the bar and just kind of express myself and help the company wherever I could,” Lucero said. Lucero eventually held a marketing position and said that, with Gonzales’ mentorship, she was able to grow and be confident in her new role as event coordinator. Lucero is responsible for planning and executing events at all three Marble locations. She also specializes in food and beer pairings. Both Gonzales and Lucero attribute their success within the independent craft brewery to the strength of the entire Marble team. By building a team with creative freedom in mind, Marble has set the standard for how to treat team members from the bottom up. Gonzales agrees. She said no position at Marble is more important than another. The team thrives off knowing they have a strong support system at work. “We have so many beautiful, strong women and men that work at Marble. They’re intelligent. They’re creative.” Gonzales said. With three consistently-busy locations and a strong canning and distribution system, Marble Brewery is attracting Albuquerque’s beer lovers. But there’s more to the success of this business. Lucero said the constant drive to keep asking ‘”What’s next?” is what keeps Marble humming. “We’re always thinking what’s different? What’s fresh? What’s new?” Lucero said. The team at Marble also looks to other, more established, out-of-state breweries to see what’s working for them. With Colorado to the north, there are plenty of examples. For Marble Brewery, part of innovation is being able to recognize what is working and what will transcend the business. The post A Bond Built on Creativity at Marble Brewery appeared first on CraftBeer.com.